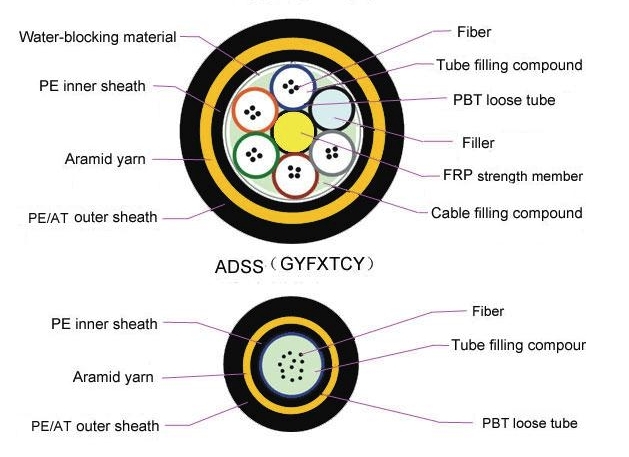 FlyingFiber’s ADSS all dielectric self-supporting aerial cable provide 250μm fibers, are positioned into a loose tube made of high modulus plastics. The tubes are filled with a water-resistant filling compound. The tubes (and fillers) are stranded around a FRP (Fiber Reinforced Plastic) as a non-metallic central strength member into a compact and circular cable core. After the cable core is filled with filling compound. it is covered with thin PE (polyethylene) inner sheath. After stranded layer of aramid yarns are applied over the inner sheath as strength member, the cable is completed with PE or AT (anti-tracking) outer sheath. 1). Can be installed without shutting off the power. 2). Excellent AT performance, The maximum inductive at the operating point of AT sheath can reach 25kV. 3). Light weight and small diameter reducing the load caused by ice and wind and the load on towers and backprops. 4). Large span lengths and the largest span is over 1000m. 5). Good performance of tensile strength and temperature. 6). The design life span is 30 years. 7). 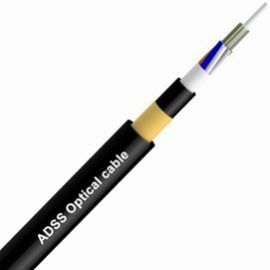 ADSS cable complies with Standard IEEE P 1222 as well as IEC 60794-1. The actual status of overhead power lines is taken into full consideration when ADSS cable is being designed. For overhead power lines under 110kV, PE outer sheath is applied. FOR power lines equal to or over 110kV, AT outer sheath is applied. The dedicate design of aramid quantity and stranding process can satisfy the demand on various spans.